Houdini, Blackstone, Thurston, Dante, Doug Henning have one thing in common aside from all being famous magicians who are now dead. If you mention any of those names and many more of that era, people who are not magicians immediately conjure up a picture of a magician. They were world famous, with travelling shows and big posters plastered all over the place. Today there is David Copperfield. Penn & Teller are also well known as far as being household names. There are other magicians with great stage shows, but their names don’t mean anything to the public at large. Here in Quebec there is Luc Langevin. Thanks to television he was able to reach a large population. Is he known around the world? Not yet. But he is young so there’s time. I’m sure there are others whom I haven’t mentioned so if you want to add to my list just put them in the comments at the bottom. Things have changed. At one time many magic shows were travelling around the country competing for audiences. Now comedians are all the rage. There are comedy TV shows, featuring stand up comedians, one after the other. There are comedy clubs like The Comedy Nest and Comedy Festivals like Just For Laughs. Its great in this day and age. Can you imagine travelling around the country or countries with tons of illusions. Ask Ted Outerbridge. It ain’t easy or cheap. A comedian carries all the material in his head. No luggage ( maybe plenty of baggage but no luggage). All you need is yourself and you have to be funny. Enter the magician. A few blogs back I wrote about Richard Sanders performing at the Comedy Nest in Montreal. 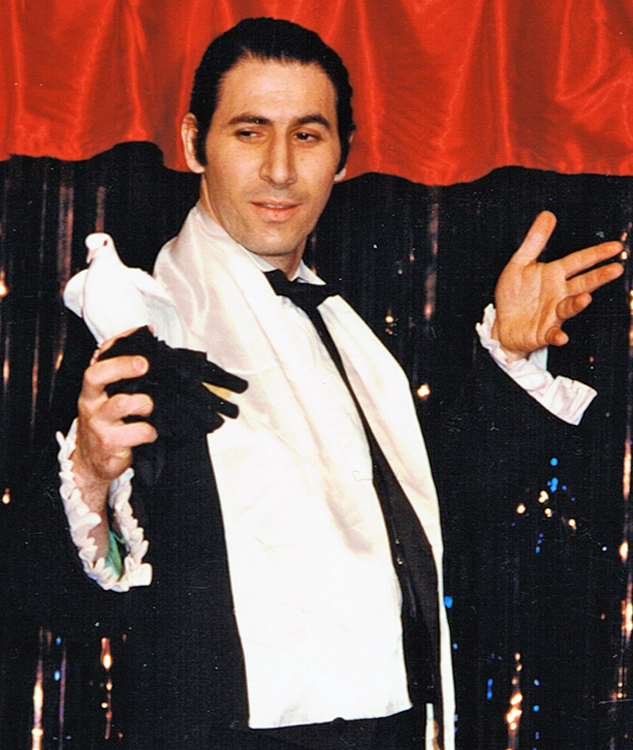 He was hilarious and he did some impeccable magic, but you would never say you saw a magic show. There were no big illusions. He didn’t look like a magician, in the traditional sense. He looked like a regular guy you would see on the street, mussed up hair, casual clothes, and the way he spoke, it seemed like he was making it up as he went along and yet he was laugh out loud funny. Could anyone do that? I don’t think so. I think you have to have something to begin with. But even having that, its not automatic. Furthermore, I don’t think he was making anything up as he went along. Sure he took advantage of responses from the audience which he involved to a great degree, but he knew exactly where he was going. Eugene Burger once gave a lecture for us and he pointed out that people buy magic, they learn the tricks well, and then they go and perform them…without a script. He said it was as though they thought the right words would just pop into their heads when they needed them. He said every word he said, every move he made, had a purpose. That was over 20 years ago, but I never forgot it. When performing a card trick he made a comment which made everyone laugh. It was to us an off the cuff remark. Later in the lecture he explained he had to do a “dangerous” move and when people laugh they throw their heads back and blink for a second. That’s all the time he needed and that “off the cuff remark” was a set part of his routine. Mac King has a comedy magic show in Las Vegas which he has had for years. I assure you, nothing is left to chance. I saw him perform in person twice. Once he was at Magie Montreal, in 1993, and then I saw him at Club Soda. Same jokes but they appear fresh every time and they work every time. So there is a market out there. But you have to build a show. Step by step, word by word. So if you have a tendency towards comedy and you do magic how do you go about it? Enter the magic dealer. There is help out there. In fact the Camirand Academy of Magic just released a DVD Comedy 101 with 14 routines on it for props many of you probably already have. 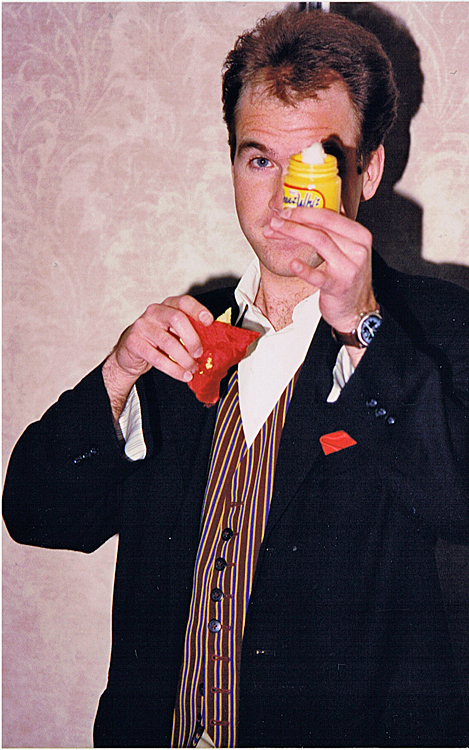 David Kaye has a book and a DVD called Seriously Silly, on how to entertain children with comedy and magic. And then there is the classic 5 Minutes with a Pocket Handkerchief for kindergarten kids. To me, the difference between performing magic, performing comedy magic, and stand up comedy is this. In stand up comedy, the objective is to be funny. You really have to be funny. In magic without comedy, you’re hopefully creating wonder and amazement. In comedy magic, you have to be funny, but that isn’t the objective. The comedy is misdirection.You’re making them laugh while you’re setting them up. The amazement should still be there, but they won’t leave scratching their heads, they’ll leave with a smile on their face. But it all has to be thought out, and its a serious business. Fortunately for Montreal Magicians there are 2 Comedy Clubs in Montreal with open mics. If you have a good 5 or 6 minute routine, you have a place to cut your teeth or get your feet wet, so to speak. There’s the Comedy Works on Monday nights and The Comedy Nest on Wednesday nights. Give it a try! They’re looking for talent so if you think you have some, go for it! If you live in another city, check out the comedy clubs there and I’d bet they have open mic nights too. Break a leg! When Two Clowns Get Together! David Acer & Simon Lovell! 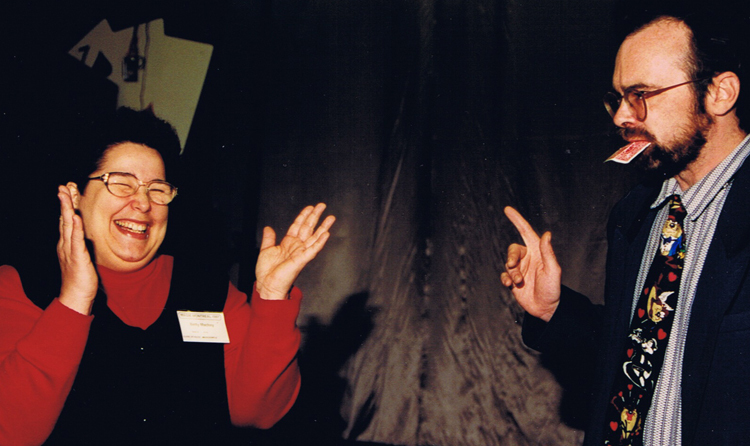 As I was going through the photos for the Ted Outerbridge blog, I found them in the Magie Montreal 1997 file. As I went through them I had to laugh at a couple of the photos. If you were there I’m sure you will remember what fun we had with these two guys. I thought you might enjoy the memories as I did. 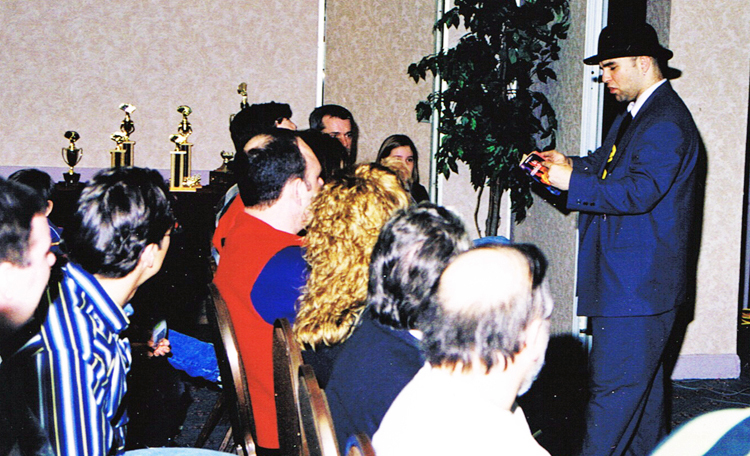 Last week I wrote about Magician Ted Outerbridge. I also spoke to him and and asked him to write about himself for our blog. He did, so enjoy! I have been reminiscing about Perfect Magic since we spoke on the phone yesterday. My first memories of Perfect Magic are visiting your basement store and drooling over a “Chalet Magic” Dove to Rabbit prop. I remember producing a dove at a Perfect Magic “Performers Platform” competition and watching in horror as the dove flew around the store for what felt like an eternity. Later I competed in “Magie Montréal” competitions and I vividly remember the great honour of winning the “Magic Tom” Auburn Award. I also recall regular visits to the store proudly carrying my young son Matthew on my shoulders; he really enjoyed visiting you and Phil! On a few occasions I had the pleasure of working behind the counter at Perfect Magic which was a lot of fun. I am very grateful that over the years you and Phil have always had the time to listen to my stories of success and failure and offer words of encouragement. A: The first trick that made an impression on me was the 20th Century Silks. I watched “Magic Tom” Auburn performing this trick when I was 8 years old. I still remember standing in front of a television while at a cottage in the Laurentians, watching this miracle occur! This was a turning point for me and I decided that I wanted to become a magician. 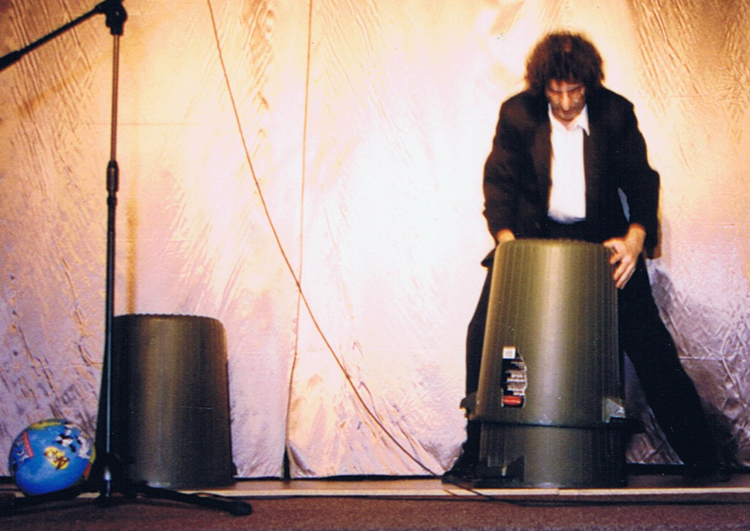 A few years later I was 12 years old, and performed my first professional show for $5 at a friend’s birthday party as “Magic Ted”. It was both terrifying and exciting. My first trick was the 20th Century Silks. I vanished a handkerchief and it reappeared tied between two others. Five minutes later the vanished handkerchief re-appeared hanging out of the back of my jacket! Oops! A: Here is what I have learned so far. Perform whenever you can. No matter what happens, good or bad, you will learn something. No learning is ever wasted. Try things that scare you. Videotape your performances. Be your worst critic. Congratulate yourself. Remember that no matter what you do, some people will love it and some will hate it. Nobody can make everybody happy all the time. Make notes. Never stop caring. Look for feedback. Listen to feedback but don’t follow it blindly. Behave like who you want to be. You are the product so take good care of yourself. Look to other forms of entertainment as inspiration. Surround yourself with good people. Don’t just try to fool people, give your magic some meaning, strive to give your audience goose bumps, move them and make them care about what you are doing, and… drink lots of water. Reaching For A Star and Catching It! That’s Magic! We’ve known Ted Outerbridge since he was a kid. He had a dream and didn’t let go. He worked hard. He struggled but never gave up. It paid off. Last week in the Gazette, there was an article about him. We were thrilled to see it. 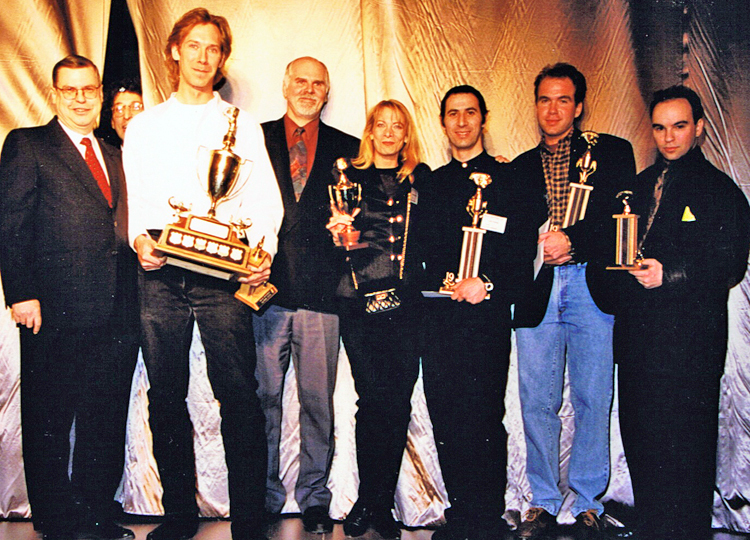 In 1997, before he was famous, he won the Tom Auburn Award at Magic Montreal, the Annual Magic Convention produced by Perfect Magic and Wim Vermeys for 19 years. It was a sign of things to come. I spoke to him and asked him to write about himself and to include what got him to decide to make a career of this and also what tip he could give to up and coming magicians. I’ll publish it when I get it. In the meantime…Ted and Marion…Keep on truckin’! I have included photos of Wim Vermeys and Phil Matlin and the Trophy Winners of Magic Montreal 1997 and we have David Acer, sticking his head through the curtains in the back. He was never one to be left out! David was the M.C. of the stage show that year, hilarious as usual!